Alaska is so big that it’s divided into five regions. Each region offers excellent opportunities to sightseen from coastal plains to mountain ranges. No matter where you go, there is a significant chance to spot wildlife. Grizzly bears, polar bears, moose, Dall sheep, mountain goats and many, many more, make Alaska a mecca experience for tourists and hunters. Also, sparkling glaciers and snow-capped mountains make Alaska a magical destination for relaxing and adventure. Wildlife cruises leave around the clock for Kenai Fjords National Park to look for whales, seals and sea lions. What are you waiting for? Your Alaska adventure is waiting out there! Kenai Fjords Glacier Lodge rests in the heart of the Kenai Fjords National Park making it the ideal location for enjoying outdoor activities both on the water and on land. Choose from a variety of guided trips including photo journeys, Join in on professionally guided hikes on expeditions through the Fjords and Denali National Parks. The incredible icy waters of the Pedersen Lagoon and the Aialik Bay are prefects to cast your line. Highest point on Kenai Peninsula is Truuli Peak, 6,612 feet above sea level (midway between Homer and Seward in the Harding Icefield). Kenai Fjords Glacier Lodge's 16 cabins offer comfortable beds, cozy porches with chairs, and private bathrooms. A place to rest, relax and reconnect with wildlife! The Kenai Riverside Lodge is a charming retreat that offers you a place where you can breathe in the fresh air and soak up the sights of the stunning scenery. Kenai Riverside Lodge makes it easy to get out and enjoy the vast wilderness of the Kenai Peninsula on your Alaska vacation. Fully guided and equipped trips throughout the area help you to enjoy hiking, rafting, and fishing. 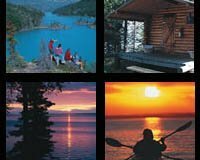 Your all-inclusive Alaska vacation includes the comfort of your own private cabin, equipped with private bath, cozy porch, and other touches for your convenience. At Kenai Riverside Lodge you can soak up the views from the riverside deck, explore the rugged scenery on a guided hiking trip, or cast your line into the magnificent waters of the river. Did you know... that the ice of the glaciers looks blue because the long, red wavelengths are absorbed by the ice crystals while the short, blue wavelengths are transmitted and scattered. The more densely crystallized the ice, the bluer it looks, which is why glaciers are often such a vibrant turquoise! Surrounded by the lush forests and the calming sounds of the Naknek River, you'll discover a different kind of adventure every day! Plan that all-inclusive fishing destinations with Alaska's Gold Creek Lodge. Their prime location near the Naknek River gives you easy access to the rapid waters teeming with all variety of salmon, and other species such as northern pike, arctic char and more! After an exciting day outdoors, indulge in your cabin that features two double beds and a private bath, along with amenities such as a fireplace and private deck. Everything you need for a complete fishing getaway adventure you find it at Alaska's Gold Creek Lodge. King Salmon is only accessible by air, which ensures you a truly remote wilderness experience away from the crowds. While in Alaska, take time out of our vacation to visit the breathtaking White Mountains! A 71-mile mountain range in the Yukon-Koyukuk Census Area that offers stunning scenery, peaceful solitude, and outstanding opportunities for year-round recreation. The stunning Kenai Peninsula of Alaska is a nature lover's paradise. Salmon Catcher Lodge's professional guides will ensure you're well-equipped with the best gear before heading out on your fishing trip. Spend your day fishing for salmon, hunting for moose or bear. No matter what, you're guaranteed to have an incredible time in Alaska. Nearby glacier sightseeing tours are also available. SalmonCatcher Lodge offers a lodging option that reflects the natural beauty of the area, with furnishings handmade by local craftsmen. Partake in a land-based tour that allows you to direct access to glaciers. Driving over rocks, splashing through mud, and exploring Alaska terrain on an ATV is an excellent way to experience glaciers on land! Join in the fun on the Fourth of July when local racers challenge the 3,022-foot Mt. Marathon in a race to the top and back. Resting along the shores of a glacier-carved lake and accessible only by boat, Kenai Backcountry Lodge is the perfect adventure destination! At Kenai Backcountry Lodge you will find all of Alaska Wildland Adventures' trips! Whether you're enjoying a hike up Cottonwood Trail, chartering a fishing cruise, or a relaxing kayak ride across the waters of Skilak Lake, you are sure to have the time of your life in this beautiful land. The all-inclusive experience at Kenai Backcountry Lodge makes it a fantastic home-base for all your Alaska adventures. The Alaska SeaLife Center offers up-close viewing of marine mammals and sea birds. The lodge is equipped with books, board games, a wood stove and comfortable spaces - you're welcome to enjoy it at your leisure. Afognak Wilderness Lodge is the only lodge or residence in the Afognak Island State Park! Offering the best of Alaska, Afognak Wilderness Lodge awaits with endless outdoor recreation. A boat-travel with USCG licensed guides is the beginning of this unique adventure. Their staff will provide you with the necessary gear for days and days of fishing! Sockeye, Pink and Silver Salmon and Rainbow, Steelhead and Dolly Varden Trout call these streams home. Afognak Wilderness Lodge has it all, fresh and saltwater fishing, deep sea, spinning, and fly-fishing are available! Take a saltwater kayaking trip and you'll quietly slice through the waves as you approach a rookery of puffins or a raft of sea otters. Dog sledding— it's not only an Alaskan tradition, but also a state obsession, one that's celebrated every March with the running of the 1,150-mile Iditarod Sled Dog Race from Anchorage to Nome. Discover a quintessential Alaska getaway just steps away from beautiful Trail Lake. Trail Lake Lodge is a charming, down-home retreat, featuring 22 rooms and a prime location just minutes away from exciting Kenai Peninsula adventures. You'll feel right at home in one of Trail Lake's lodge or motel rooms, each equipped with private bath and television for your comfort and convenience. When you're not relaxing indoors, you can indulge in a wealth of activities right outside your door. The lodge offers fishing trips that fly you out to some of the most beautiful and remote mountain lakes in the area. You can also choose from five or seven-day all-inclusive adventures that take you through the Kenai National Wildlife Refuge to uncover incredible spots for fishing, hiking and canoeing! The Kenai Peninsula is an angler's paradise and with Trail Lake Lodge you'll be right in the heart of all the action! This breathtaking location means you're never far from the water where you can cast your line for trophy trout, salmon, and halibut. Anglers can be flown into remote mountain lakes and streams. If you're looking for an exciting outdoor getaway in the stunning wonders of Alaska, then look no further than The Alaska Adventure Company. Just as their name suggests, The Alaska Adventure Company specializes in creating a wide variety of incredible adventures to choose from on your next Alaska vacation. Explore the stunning scenery of the Kenai Peninsula on a wilderness tour that includes hiking, kayaking, fishing and so much more. The Company’s bundled tour packages come in all styles and categories so you're guaranteed to find the one that best suits your needs. They focus on families, couples, and small groups and cater their trips toward nature-lovers, adventure-seekers, and those looking to escape the hustle-bustle of the cities. 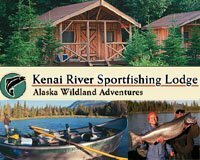 Whether you're here to experience world-class salmon fishing for the first time or you're interested in the chance to explore the beautiful Kenai Peninsula on a scenic adventure tour, you're sure to experience a unique vacation that’s impossible to forget! The population of Anchorage, Alaska is 294,356. The Company's packages all include lodge accommodations, meals, and equipment no matter which kind of experience you pick. Located beside the beautiful Chugach National Forest and the Kenai National Wildlife Refuge, Drifter's Lodge is a nature-lovers and adventure paradise. Kenai River Drifter's Lodge incredible location means you're never far from the fun. Enjoy exceptional activities that include guided fishing trips with boats and all professional equipment included. Cast a line on the world-famous Kenai River. Or if you prefer, take a rafting or hiking trip. Discover the wonders of Mother Nature in a variety of ways, and fall in love with Alaska! Kenai River Drifter's Lodge's cabins offer stunning natural surroundings and plenty of privacy. Complete with kitchens, bathrooms, cozy living space, porch, and comfortable beds, your cabin has everything you need for a great stay! 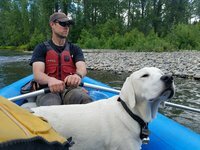 When you visit Kenai River Drifter's Lodge, make sure you take a trip over to the beautiful Kenai Lake for a peaceful day of kayaking across the gentle waters. You will love the views! The historic Summit Lake Lodge is the perfect place for your Alaska adventure. Whether you're an expert or a beginner, Summit Lake Lodge professional guides will help you to choose from drift fishing along the Kenai River, backcountry fishing at hidden lakes and rivers, deep-sea halibut fishing in famous Seward, or fly-out salmon fishing at Redoubt Bay. Their guides will provide you with the best gear and equipment for a successful and safe adventure. Or if you prefer, you can plan a day of whitewater rafting along the Kenai. Live an unforgettable Alaska experience now! 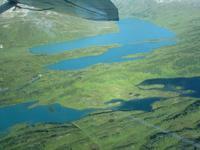 Bear Paw Adventure is located in one of the most scenic areas in the world, the Kenai Peninsula. Bear Paw Adventure's 14-acre property offers a truly relaxing, private location for endless adventures. 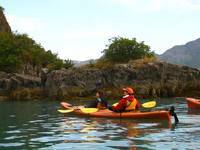 Enjoy kayaking at the bay, visit Yukon Island, or go horseback riding through the wilderness trails. 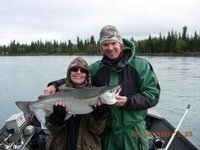 Fishing opportunities are everywhere, the Anchor River and the Homer Spit fishing hole, offer an excellent chance of unguided fishing. Or if you prefer, halibut and salmon fishing guided trips are also available in the area. 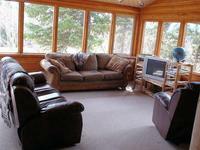 Once you are back to the cabin, you'll love the secluded, natural setting of these accommodations! Bear Paw Adventure unique log buildings and cabins feature complete kitchens, wireless internet, satellite TV with DVD player and decks with gas grills. The longest day, in the Kenai Peninsula Alaska, is June 21 and it's 19 hours and 21 minutes long! 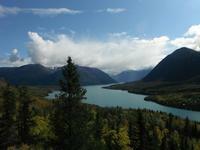 The beautiful Kenai Peninsula is a fantastic destination for nature lovers of all ages. The Great Alaska Adventure knows how to plan an adventure! Their prime location puts you just minutes away from exciting outdoor adventures. Whether you choose an all-inclusive fishing adventure, whitewater rafting, or wildlife viewing, you will be led by professional guides. Great Alaska Adventure provides top equipment, and delicious meals to keep you energized throughout the day! Great Alaska Adventures' all-inclusive packages make it easy to get out and experience this natural wonderland for yourself. Alaska is one of the most undisturbed areas on Earth. When you stay at Great Alaska Adventures, you learn about the environment and the wildlife that lives.